several houses collapsed and many others developed cracks after over a hectare land subsided at an underground mine of Sangramgarh Coaleries of Eastern Coalfields at Samadi village in Burdwan district of West Bengal on June 18. About 500 villagers have been shifted to a different place. An 11-year-old boy was buried under rubble and could be rescued with great effort. People accused Eastern Coalfields of removing the pillars from the underground mine and avoiding sand filling. these increase the chances of mine roof collapse. Block Development Officer Sankha Santra also accused the company of exposing the coal seams that attract people and coal mafia to extract more coal without safety measures. Eastern Coalfields, however, put the blame on people. "This mine was suspended on June 12 and later local people started mining it," said D K Roy, superintending engineer, Eastern Coalfields. The Salanpur block of Burdwan bordering Jharkhand has several coal mines, underground and open cast. The excavated matter has been burning for many years. Increased moisture due to rains and limited supply of oxygen interrupted the burning. As a result the area has started yielding carbon monoxide, a poisonous gas. People living there fell unconsciousness and had to be hospitalized. The company was supposed to do blanketing with clay and spray water, but villagers say it did not do so. 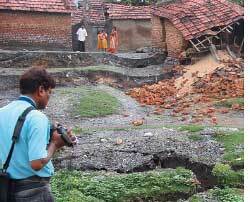 In 1991, 24 people were killed in land subsidence. Villagers were promised rehabilitation but nothing happened.